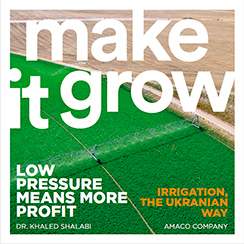 It is a pleasure to present to you the second issue of our magazine “MAKE IT GROW”. We have been working on this to continue exceeding your expectations, sharing with you our new ideas, our latest products, introducing our closest partners and suppliers, informing you about industry trends and what we are doing to help our customers to produce more and more effectively. We hope that everyone really enjoys reading #2 “MAKE IT GROW“. Available in English, Spanish and Arabic.